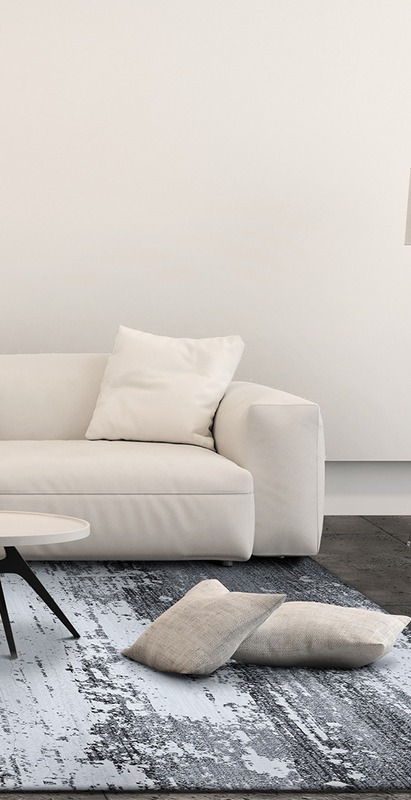 Purchasing an area rug could represent a significant investment and, like all quality home furnishings, proper care is required to maintain its beauty. With the correct care and maintenance you will extend the life of your area rug and assure many years of comfort and satisfaction. We recommend that you follow these care and maintenance guidelines in order to protect your area rug. When placing an area rug on hard surface flooring such as hardwood, ceramic, tiles, parquet, and resilient vinyl, or on soft surface flooring, such as carpeting, we recommend that you purchase a pad to put beneath your area rug. This will keep your area rug from sliding, which can cause premature wear and potential risk of injury. Our Eco Stay™ and Eco Grip™ non-slip area rug pads are constructed of natural soy bean oil and polyester textile coated with polymer. These hand-washable pads keep your area rug in its place, protect your floor, help your area rug last longer and make vacuuming easier. Eco Stay™ and Eco Grip™ pads can be cut to fit any area rug rectangle size or special shape. Using padding of a lower standard or insufficient density will cause your area rug to wear prematurely. In addition to proper padding it is important to rotate your area rug periodically. Over time, set traffic paths in your home and/or sunlight patterns can cause fading or uneven wear to an area rug that is not occasionally rotated. 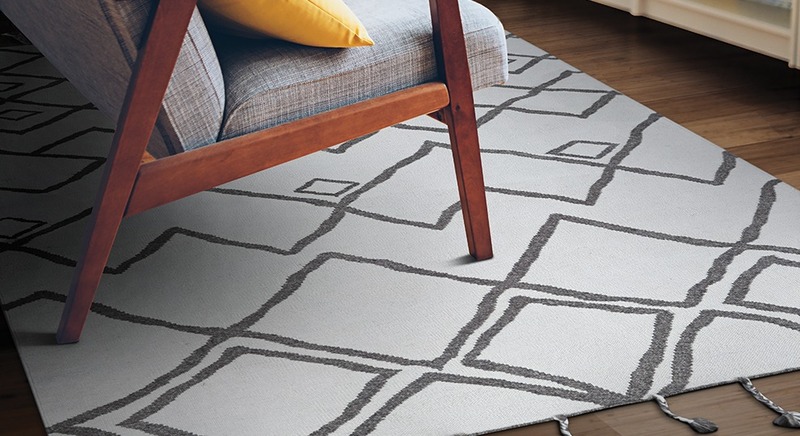 Area rug fibers are designed to hide soil and reflect light. Consequently, soil in an area rug is not as visible as it is on smooth flooring where soil remains on the surface and is easily seen. The lack of apparent soiling does not eliminate the need for regular cleaning. Soil can damage the fibers permanently if allowed to remain in the pile. Do not wait until your area rug is soiled, proper vacuuming is the easiest and most effective way to remove everyday dirt and dust. We recommend vacuuming area rugs in your home that receive the most traffic once a day to keep soil from accumulating. Ideally, all floor coverings should be vacuumed a minimum of once a week. We suggest using a good quality vacuum that features a beater brush that can be adjusted to pile height. Improper maintenance or overly aggressive vacuum methods may cause the pile of a hand-knotted area rug to sprout (Special care should be taken as vacuuming with a beater bar can catch or pull the knots and fringe, causing severe damage to your hand-knotted area rug). Keep brushes clean and replace when worn. 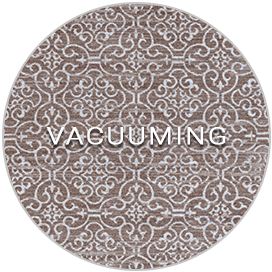 Inspect the vacuum head for rough edges or bent metal that may damage your area rug. Inspect belts frequently to make certain they are working properly. Follow the vacuum cleaner manufacturer’s instructions and change the filter bag when it reaches the “full line”. Daily vacuuming is the most important cleaning activity, however immediate treatment must be taken for spills, spots or stains. Remember to act quickly! Many spills can be removed if immediate action is taken; the longer the delay the higher the probability of a spill becoming a permanent stain. Complete removal of many common spills may require repeated use of a single solution or the use of a combination of solutions. Always use the solutions in the recommended concentration. Continue using each solution as long as there is noticeable improvement or transfer of the spill. Follow these simple steps carefully in sequence. Blot liquids with a dry, white absorbent cloth or a white paper towel with no printing. Do not scrub the stain! Scrubbing can cause pile distortion in the affected area. Continue to use a dry cloth or paper towels until the area is completely dry. For water-soluble stains (with or without odor), spray with a solution mixture of ¼ teaspoon of clear dishwashing liquid (non-bleach, non-lanolin, no optical brighteners) and 1 cup of warm water. Allow the detergent solution to remain on the affected area for 10 to 15 minutes to lift the stain. Blot in a single direction with a white paper towel. Spray with water to rinse. Blot dry in a single direction with a white towel and repeat if necessary. Never use an automatic dishwasher detergent because many contain bleaching solutions that can destroy the area rug’s color and damage fibers. Never use a laundry detergent of any type as they may contain optical brighteners (fluorescent dyes) that dye the fiber. For semi-solid spills, gently scrape up with a rounded spoon. Solids should be broken up and vacuumed until completely removed. If the spot can be identified, locate the substance in the Treatments Chart below and follow the directions carefully. If water fails, the next step is a solvent. Pre-test any spot removal agent with a few drops to an inconspicuous area of the area rug to make certain the solvent will not damage the fiber or the dye. After applying several drops to the testing area, hold a white cloth on the wet area for 10 seconds. Examine the area rug and cloth for color transfer, color change or damage to the area rug. If a change occurs, select another cleaning solvent. Apply a small amount of the selected solvent to a white cloth, allow it to sit for about 10 minutes and work in gently. Work from the edges of the spill (or stain) to the center to prevent the spill (or stain) from spreading. Do not scrub! Blot the area, absorbing as much as possible, and repeat if necessary. 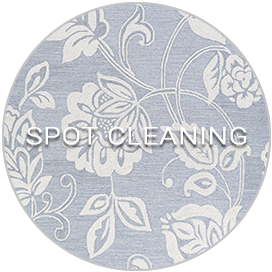 Unusual spots and stains may require specialized removal procedures to avoid permanent damage to fibers or dyes. 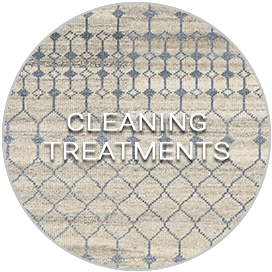 We suggest sending your area rug to a reputable professional who is accustomed to cleaning area rugs of such high quality. You should always check their references. In-home cleaning is not recommended. Attempting to clean your area rug with a wet process of any kind, including, but not limited to, hot water extraction, carpet shampooing, or commercial aerosol foam products intended for carpeting may permanently damage your area rug and will void your warranty. Chill with aerosol freezing agent or ice cubes in a plastic bag. Pick or scrape off gum.